little noses, jutting chins, receding chins, narrow heads, wide heads, flaring jaws, and what not. Have some real fun while you arc at it. You may or may not l>c interested in cartooning, but it is fun to draw characters, and you will find that you can do better than you might have thought possible. Watch the perspective and construction as carefully as you would in drawing any head, but exaggerate all you can. A good way to experiment is to jot down l>eforchand a little description of the character you wish to draw, then try to draw the head you have described. Next, ask someone else to give you a description of a character. Try that. Such practice means that you can, at an early stage of your knowledge, begin to create, as you would if you were an illustrator. Stick fairly close to outline heads just now, but try to create the type you want. As an example, your description might be something like this: "John is big and raw-boned. His eyes are dcepsct under shaggy brows. There are hollows under his checkboncs. He has a big nose, heavy jaw and chin. His hair, though thin on top. is bushy around his ears and the l>ack of his head. His eyes are small, dark, and beady." 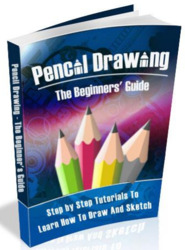 Now try to draw John with the knowledge at your present command. The planes of the head should l>c memorized, for through them we have a foundation for rendering the head in light and shadow. Begin with the basic planes (top. left), and study them until they are fixed in your mind. Then take up the secondary planes. From these sets of planes almost any head can be built. 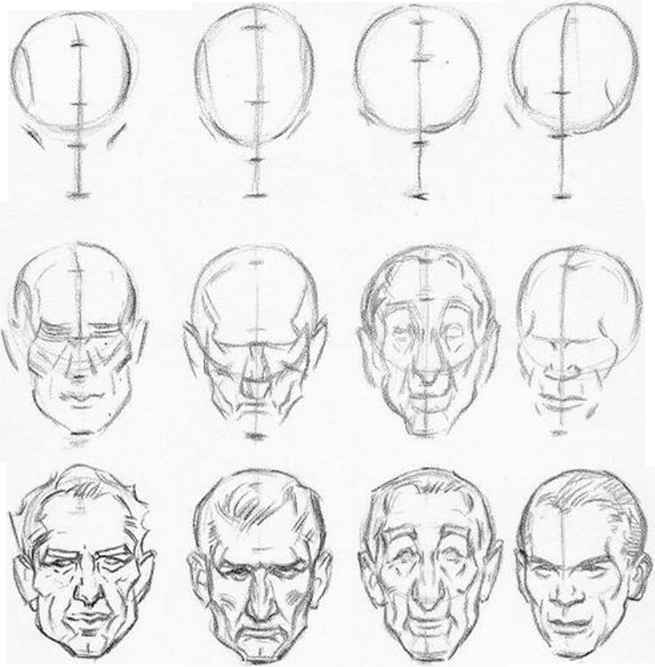 The surface varies with the individual character, but with the planes shown here you can produce a well-proportioned, manly head. Planes help ns to maintain construction throughout the face and head, within the construction lines or divisions of the basic ball and plane. The muzzle becomes easier to draw in all sorts of tilted positions. The slant of the cheeks and the rounded rectangle of the forehead fall into place within the three divisions of the face. By thus representing the head in block form, we determine the angles throughout the head. This is our first step toward the perspective of the head. The handling of perspective marks the difference between the amateur and the professional. Every object drawn has to have an eye level or horizon, felt if not actually represented. On the left we see the planes of the head as seen from al>ove or l>clow the eye level. If a head were as big as a building it would be affected bv perspective in the same way as a building is. In order to create differences in type and character, we may decide not to follow the basic measurements or divisions too meticulously. 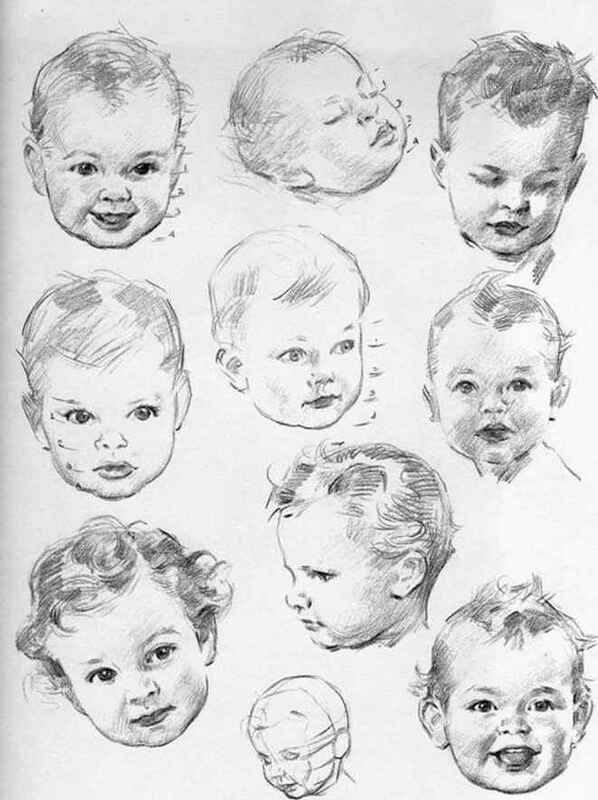 By varying the proportions of the three divisions of the face, we come up with a good deal of variety in the results. There are thousands of possible combinations. It is fun to experiment with them. 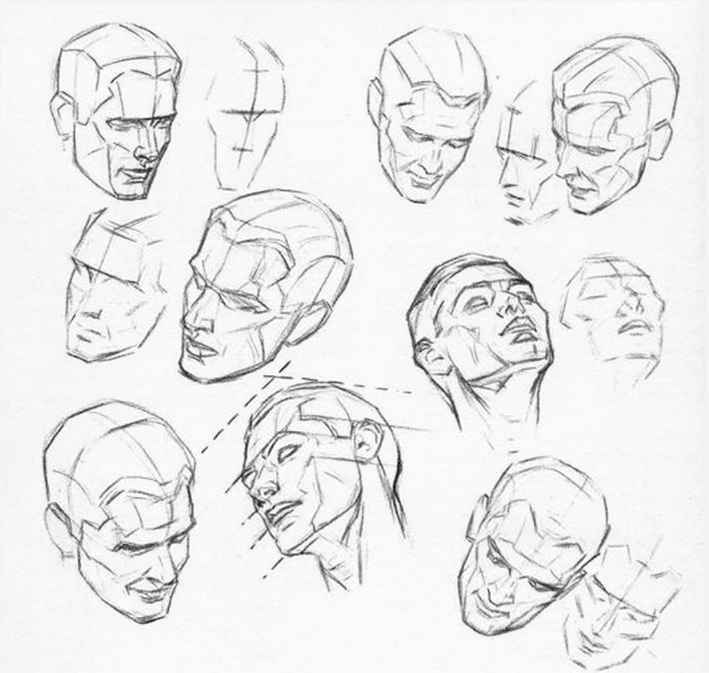 Always remember when drawing a head to balance the forms on both sides of the middle line. The bony parts stay fixed, and the expression fits in between. All the jaw can do is open and close. The expression lies in the eyes, cheeks, and mouth, with some wrinkling of the forehead and around the eyes. What we do on one side, we must do on the other. How draw manga head amatour? How to draw a head tilted? How to draw faces tilted? 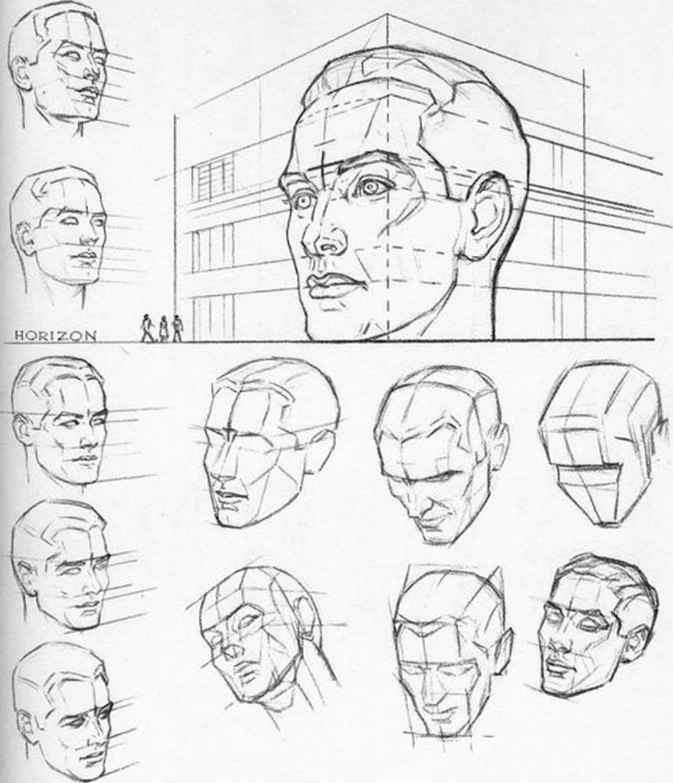 What do the lines on sketching head mean? How to draw anatomy for animation? How to draw tilted heads? How to draw tilted heads from every angle? How to draw human faces proportions? How to draw anime head tilt to side? How to draw faces and figures with a constructive lines? How to drawing face technique? How to draw heads and faces comic style? 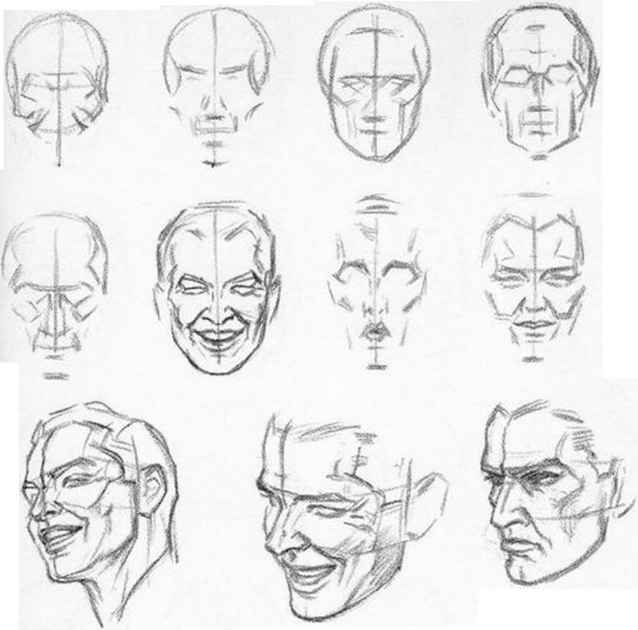 How to sketch a face freehand techniques?